IF THE ELECTION COMMISSION ACCEDES TO OUR EIGHT DEMANDS! 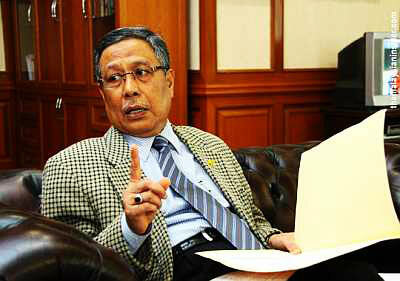 It's up to you, Tan Sri Abdul Aziz Mohd Yusof. As chairman of the Malaysian Election Commission, you have the authority to accede immediately and unconditionally to these eight demands. We know you are answerable to your political masters in UMNO. However, if you are indeed a man of honor and believe in universal virtues like fairness, integrity and the importance of clean and fair elections, then there is absolutely no reason why you cannot call a media conference within a week and declare your wholehearted support of BERSIH 2.0's demands - which are entirely reasonable and can only bring the nation one step closer to political maturity. If your masters in UMNO disagree, the least you can do is resign in protest. This way you will be lauded for your courage and nobility - instead of reviled as another corrupt functionary of a morally decadent and increasingly unpopular regime. Many of us are looking forward to some street action on July 9th - but if you take the initiative and listen to the voice of the voters, we are more than happy to quietly celebrate at home this major victory for democracy. Fat chance. That's like Najeeb washing his hands after going to the loo. Fat hopes! His job & career is at stake. UMNO will disown him & he will be isolated & labeled as a Traitor by UMNO & Pekasa. No way!! They should have allowed BERSIH 2.0 rally to go on and make it a peaceful rally like what happened in Chile around the same time, where people were kissing and feeling happy during the peaceful demonstration there. The police were there but they did not have to use any force like firing tear gas, shooting water canons or shooting with their rifles. And then, Najib should have offered an 'olive branch' to the demonstrators, talk to them, accept their demands and use those very demands to negotiate. That way, he would be regarded as a world class leader. Where were Najib's APCO PR experts who were paid millions when they were needed?